We are very excited to bring you a highly effective integration to help you get matching donations! When the donor selects the amount she wants to donate, we ask her for the company that she works for. 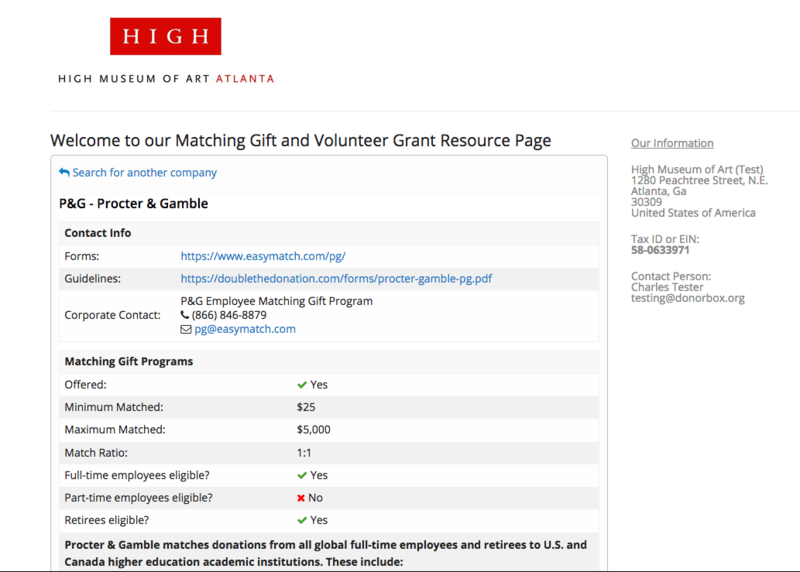 After the donation, we give the donor a link to a matching gift page with her company’s matching donation procedures. This matching gift page is branded with your logo and has your tax ID and contact information. It also has answers to the most frequently asked questions that donors have about corporate matching. To see an example of a matching gift page, click here. Additionally, we will send two emails. 1. An email to the Donorbox admin to notify you of the donor who selected a company to match her donation. You might use this information to help guide your donor to finish the matching application. 2. An email to the donor with a link to the donation matching gift page above. With this email, she has a saved record of her company’s matching donation procedure in her inbox. If the donor did not for her company, we will also send her an email with a link to the company search page. This is helpful if the donor wants to look up a company’s matching donation information later. You can find the url to your company search page under your company matching settings. Feel free link to this matching page anywhere in your organization’s website! If you want to keep your donors in your website, a great alternative to using the company search page is our Embeddable Company Search Widget. 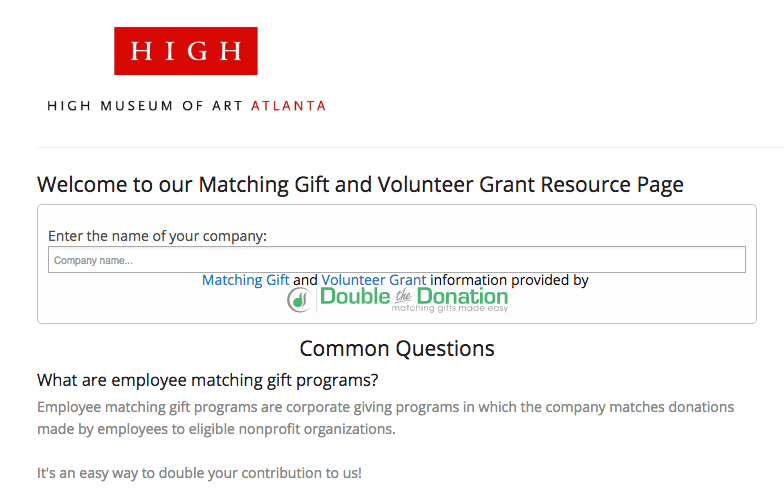 With the search widget, you can put an employer donation matching search box in your organization’s website. The embed code can also be found on your company matching settings. Just copy and paste the code in your web page’s html. To test how this works, please click on the donate button below and test out the donation flow. You can use the following card information to test the donation. For a limited time, this integration only costs $40/month. This is a small investment that will be paid back with likely just one matching donation. You can enable this feature with 3 steps. 1. Fill out the nonprofit information form in Donorbox. 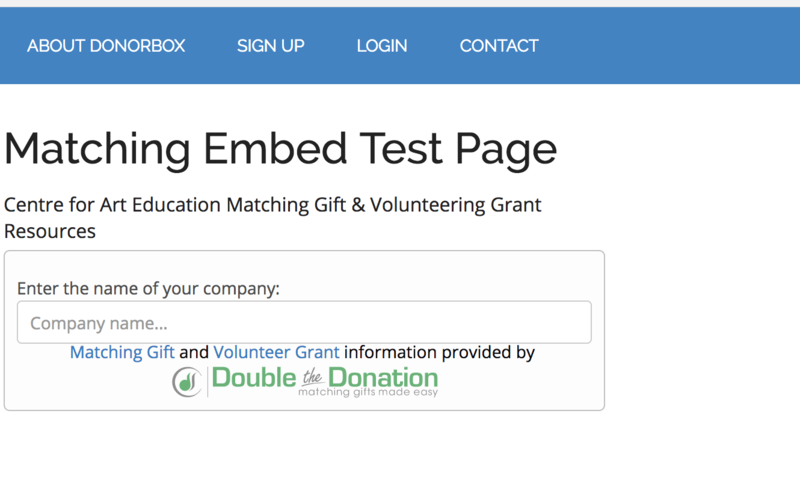 https://donorbox.org/org/edit_info.This will display your nonprofit’s tax ID, address, and contact information on the donation matching gift page. Your donor will use your information to fill out her matching application. 3. Finally, click Enable Donation Matching on the company matching settings page. 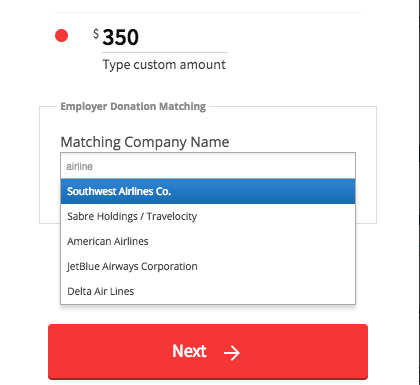 https://donorbox.org/org/company_matching. We encourage you to give this integration a try as we are confident that your donors’ companies will match and increase the impact of their donations.